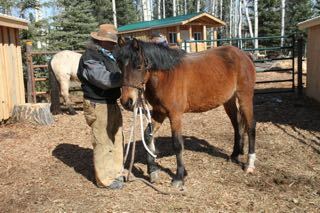 The gentling of the rescued wild horses has begun in ernest. 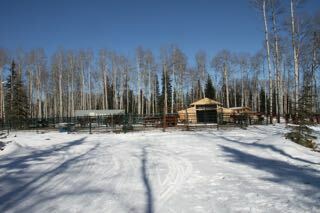 So far we have halters on over half of our recent charges and their handling by our volunteers is coming along great. It is amazing to us how intelligent and wonderful these horses truly are. Most of us feel that their curiosity about us overcomes their fears and thus makes this process so enjoyable. With lots of feed and fresh water, these beautiful horses have settled into quite a routine, they are always on the watch for the fresh load of hay to be delivered to their feeders several times a day. They are unafraid and walk right up to the feed cart and start eating before we can get it into their feeders. This always brings smiles to our faces and joy to our hearts. 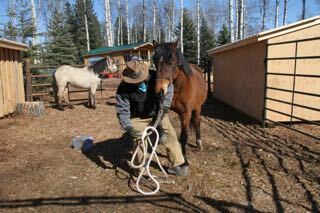 An important part of the gentling program is at first getting the halter on them and then getting them use to the lead ropes. This is what is necessary in order to teach them to lead in order that they will be safe to handle for their new owners. Here a group of them are tied to learn not to pull back. Obviously they have this lesson down pat as they rest and take in the warmth of the sun. In the process of rescuing the horses that we were given the opportunity to rescue from the auction mart, we concentrated on the younger horses that we knew we could gentle and find good homes. We did not wish to take in older horses, however, we made an exception because we were asked to take this 5-6 years old mare who is very pregnant and close to foaling. 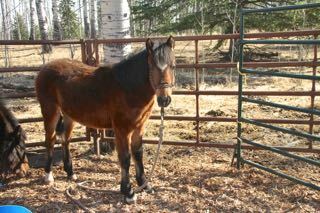 It was felt that if she was pushed through the auction it would be too hard on her and so we brought her home with us. She is a beautiful mare and definitely the boss of the youngsters in her pen. She has been examined by our vet and although she may have a future home, it has been recommended that she remain with us until she foals, which may be soon. She has a ravenous appetite and is obviously eating for two. We will be putting her in a pen where she can still be handled and yet safe. When the time comes this will allow her a secure place in order to deliver her foal. Then she will remain with us until the foal is old enough to travel without too much stress. We will always continue to work for the long-term benefit of our Alberta wild horses and will do what is necessary to meet our goals. 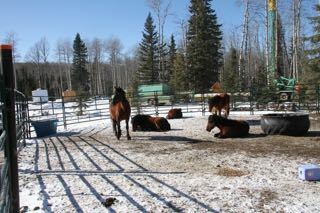 Also to this end, we have numerous requests for adoption of these beautiful young horses. So far we have found homes for eight. The fillies will be going as soon as they can be handled safely; the colts when they are gelded and can be handled safely. We still encourage people to send in their applications and to arrange a time to visit and maybe select their wildie.